Peripheral arterial disease (PAD) is a condition where the the blood flow to the limbs, arm or leg, is impaired due to a narrowing of the arteries supplying these areas. It is more likely to affect the leg than the arm and has become a global problem due to the rise in atherosclerosis. Acute limb ischemia is the sudden occlusion of the artery as a result of clot. It needs immediate medical attention as it can lead to severe ischemia (tissue injury due to poor oxygen supply) and lead to necrosis and gangrene. This may ultimately result in a loss of the limb. 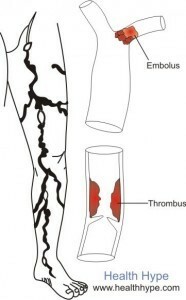 Acute limb ischemia is discussed in detail under Blood Clot in the Leg. Atherosclerosis is the most common cause of peripheral arterial disease. Here the development of atheromatous plaques in the artery wall gradually narrow the lumen of the vessel and restricts the blood flow in the leg. This if often associated with hypercholesterolemia (high cholesterol levels in the blood), cigarette smoking, hypertension (high blood pressure) and diabetes mellitus (sugar diabetes). Atherosclerosis will lead to a gradual occlusion of the artery which means that the symptoms will develop slowly. Another common causes of an arterial blokage is a blood clot. This is a blood clot that develops at the site (thrombus) or a clot that originates elsewhere in the vascular system and lodges in a leg artery (embolus). Thrombosis formation at the site is a result of turbulent blood flow and irregularities of the vessel wall thereby causing blood cells and platelets to stick to it. This forms a clot (thrombus) and can grow fairly rapidly compared to the growth of an atheroma. While the symptoms will develop more quickly than in atherosclerosis, it is still not as rapid as with an embolus. The fastest cause of an almost complete occlusion is an embolus. This is usually a blood clot that forms elsewhere in the vascular system, dislodges from the original site and travels through the bloodstream until it occludes a leg artery which is too narrow for it to pass through. This narrowing may be as a result of an atheromatous plaque or just an anatomical difference in vessel size (luminal diameter). Emboli tend to lodge at the bifurcation of vessels and in the leg, the femoral artery is one of the common sites. Emboli may not always cause a total occlusion but with time platelet and blood cells will aggregate around the embolus and completely block off the artery (refer to the diagram above). The symptoms come on very suddenly and the consequences are serious and severe if a large or medium artery is occluded. In the early stages of atherosclerotic narrowing of the artery, there may be little or no symptoms for months. One of the first and most definitive symptoms that may indicate an arterial occlusion is intermittent claudication. This is muscle pain that occurs a shortly after activity like walking and eases a few minute after rest. In most cases this is unilateral meaning that it occurs on one side unless the occlusion lies in the terminal part of the abdominal aorta. Refer to Leg Pain While Walking to differentiate between other types of claudication. As the condition progresses, leg pain may be present or even start at rest (ischemic rest pain). This will be more noticeable when lying flat because blood flow through the occlusion is aided by gravity when standing. Ultrasound imaging of the legs which may include a Doppler study as well to evaluate the flow of blood through the area. This is a non-invasive test and therefore the preferred investigation until P.A.D can be conclusively diagnosed. Angiography and CTA (computerized tomographic angiography) or MRA (magentic resonance angiography) may be considered if the facilities are available. This will provide greater clarity on the location of the occlusion and degree of blood flow restriction. It may also identify other occlusions and map the overall circulation of the leg. Conservative management is a crucial part of the treatment and management of peripheral arterial disease. Dietary changes should be targeted at a low sodium diet for hypertensive, low GI (glycemic index diet) for diabetics and low saturated and trans fat intake in hypercholesterolemia. Cessation of smoking is essential. Regular exercise involving at least 30 minutes of walking or running will assist with improving blood flow to the legs. Exercise plays a major role in symptomatic relief of intermittent claudication. The measures above are also useful for the prevention of peripheral arterial disease of the legs in high risk patients. Medication for the treatment and management of hypercholesterolemia, diabetes mellitus and hypertension is important. In addition, anticoagulants may also be necessary like aspirin and clopidrogel. This may also offer symptomatic relief for intermittent claudication. Cilostazol helps with arterial dilatation and preventing blood clots. Balloon angioplasty may help to widen the occluded artery and compress the atheromatous plaque thereby restoring blood flow to the limb.